Construction Booming In Texas, But Many Workers Pay Dearly Almost 1 million people are employed in construction in Texas, but many have a hard time making a living safely. The state's construction industry has the highest fatality rate in the nation, while large numbers of undocumented workers have suppressed wages and made it easy for contractors to exploit laborers. 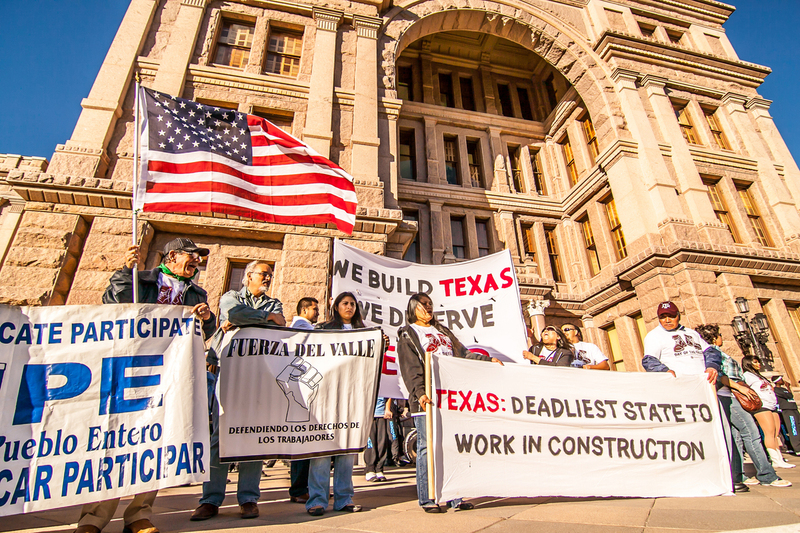 Marchers at the state capitol building in Austin, Texas, in February protest working conditions in the state's construction sector. Like almost everything in the Texas, the construction industry in the Lone Star State is big. One in every 13 workers here is employed in the state's $54 billion-per-year construction industry. Homebuilding and commercial construction may be an economic driver for the state, but it's also an industry riddled with hazards. Years of illegal immigration have pushed wages down, and accidents and wage fraud are common. Of the nearly 1 million workers laboring in construction here, approximately half are undocumented. Many of those workers have been in the U.S. for years, even decades. This critical mass of eager, mostly Hispanic workers means it's possible for a family from New York or California to move to Texas and buy a brand new, five-bedroom, 3,000-square-foot home for $160,000. Just how cheap is the cheap labor in Texas? Sometimes, it's free. Guillermo Perez, 41, is undocumented and has been working commercial construction jobs in Austin for 13 years. "[The employer] said he didn't have the money to pay me and he owed me $1,200," Perez says of one job. "I told him that I'm going to the Texas Workforce Commission, which I did. Then after that, he came back two weeks later and paid me." Perez is brave. Undocumented workers are usually too afraid to complain to Texas authorities, even when they go home with empty pockets. And they almost never talk to reporters. The economic collapse of 2008 brought with it an onslaught of wage theft, according to the Austin-based Workers Defense Project. At the end of the week, construction workers sometimes walk away with $4 or $5 an hour, sometimes less, sometimes nothing. "Ninety percent of the people who come to our organization have come because they've been robbed of their wages," says Cristina Tzintzun, the Workers Defense Project executive director. The organization has co-authored a report with the University of Texas, Austin, that examines working conditions in the Texas construction industry. For more than a year, WDP staff and University of Texas faculty canvassed Texas construction sites, surveying hundreds of workers and gathering information about pay, benefits, working conditions and employment and residency status. Cheated workers keep working, Tzintzun says, because contractors dangle wages like bait from one week to another, paying just enough to keep everybody on the hook. Two workers died when a crane collapsed under windy conditions at a University of Texas, Dallas, campus site in July 2012. OSHA cited the construction company with six serious safety violations and levied a $30,000 penalty. "We're talking large commercial projects, even state and county projects," she says. "So it's a problem that's widespread in the industry." If wage theft is a nasty cousin of slavery, Tzintzun says there's a deeper, more fundamental sickness affecting the Texas construction industry: the misclassification of construction workers as independent contractors instead of as employees. "We found that 41 percent of construction workers, regardless of immigration status, were misclassified as subcontractors," she says. It works like this: Pretend you're an interior contractor, drop by the Home Depot parking lot and pick up four Hispanic guys to install Sheetrock for $8 an hour. By law, these men are your employees, even if just for the day. But in Texas, as in many other states, it's popular to pretend they're each independent contractors — business owners. Which means you are not paying for their labor but for their business services. With this arrangement, the contractor — you — don't have to pay Social Security taxes or payroll taxes or workers' compensation or overtime. Instead, you pretend the undocumented Hispanic worker you've just paid in cash is going to pay all those state and federal taxes out of his $8 an hour himself. "Our estimation is that there's $1.6 billion being lost in federal income taxes just from Texas alone," says the Workers Defense Project's Tzintzun. The report estimates that $7 billion in wages from nearly 400,000 illegally classified construction workers is going unreported in Texas each year, resulting in billions of dollars in revenue lost owing to institutionalized statewide payroll fraud. "It's really the Wild West out there," Tzintzun says. Making a dangerous but profitable living has long been part of the Texas ethos. Handsomely paid and heavily mustached Texas Rangers died atop their horses chasing bandits and Comanches; since 1901, so-called roughnecks flush with cash have lost their fingers, and sometimes their lives, working Texas oil rigs. But working Texas construction is a good way to die while not making a good living. More construction workers die in Texas than in any other state, the WDP-UT study finds. With 10.7 deaths per 100,000 workers in 2010, construction workers in the lightly regulated Lone Star State died at twice the rate as those in California, with a rate of 5.2. That's compared with the U.S. rate of 8.8 in that same year. Take the story of 48-year-old Angel Hurtado, an undocumented roofer who died at an Austin warehouse site that had fallen behind schedule. 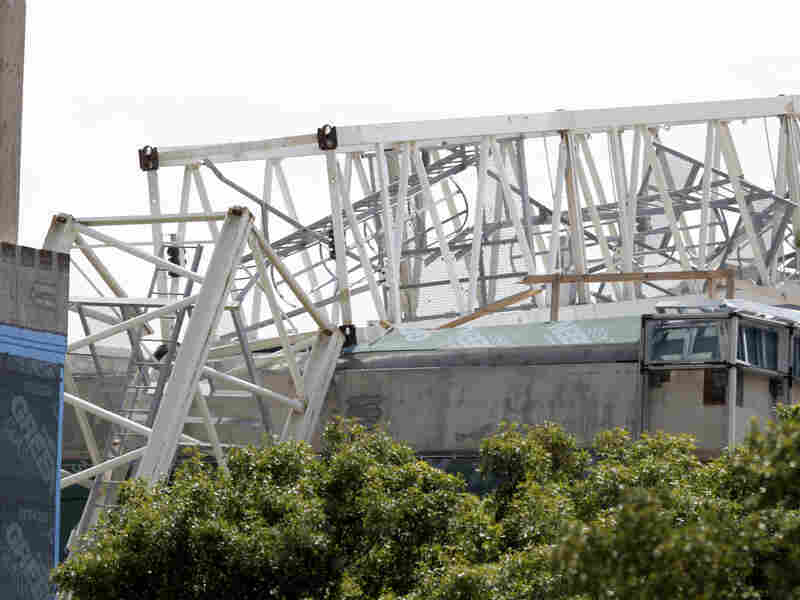 He plummeted 20 feet to a concrete floor, hitting his head on a girder as he fell. Standing on the back road in the upscale Austin suburb of West Lake Hills where his father died, Angel's son Christian grows quiet and sad. His mother was also working at the site that day and saw her husband fall. She cradled his broken head in her lap, hysterical with grief. When Christian arrived, the subcontractor took him aside and promised to pay for his father's funeral, Christian says. "The next day, we never see this guy. He never pick up the phone. We never hear anything from him, and he never called us back." According to the study, 1 in every 5 Texas construction workers will require hospitalization because of injuries on the job. Texas is the only state in the nation without mandatory workers' compensation, meaning hospitals and taxpayers usually end up shouldering the cost when uncovered construction workers are hurt. And who profits from the system in Texas? Remember that five-bedroom house for $160,000? Customers are the winners, workers are the losers and many construction firm owners have been transformed into the exploiters. That's not the case for all construction firms, of course. But for many smaller contractors and subcontractors — who together make up the majority of the industry here — it's exploit your workers and cheat the taxpayers or go out of business. Those are the cold hard Texas construction industry facts. Thursday on Morning Edition, Wade Goodwyn examines the Texas construction industry from the other side — from the contractor's perspective.